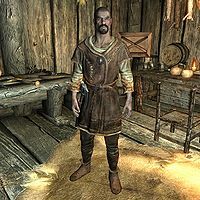 Rhorlak, a Nord bandit, is a compatriot of Rigel Strong-Arm living in Pinewatch. He wears a belted tunic along with a pair of boots. He wields a leveled war axe that can be up to elven in quality and carries a small amount of gold. This page was last modified on 13 December 2013, at 08:20.